There was a time when a grower only needed to consider the efficacy and price when deciding what fungicide to employ for disease control. However, as companies sought to discover fungicides that were more effective and less toxic to the environment and non-target organisms, the fungicides also became more site-specific. As a result, these newer fungicides were much more prone to resistance development by the pathogen. So, now growers must also consider resistance management along with efficacy and price when deciding what fungicide to apply. Effective integrated management of blossom blight begins with cultural control practices such as removing mummified fruit in tree canopies. Since the fungal pathogen, Monilinia fructicola, overwinters in these mummies, this practice can help to reduce inoculum levels – the spores that will infect the flowers. However, since it is impossible to completely remove all the inoculum, fungicide sprays are still necessary. For blossom blight management, applications need to be applied at pink (<5% flowers open), 75-100% full bloom, and 75-100% petal fall stages. Before choosing fungicides for blossom blight, one needs to look at the “big picture”. 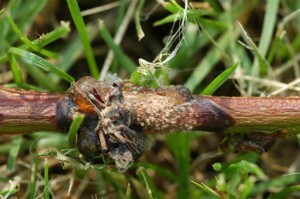 The same pathogen, M. fructicola, also causes brown rot during the preharvest and postharvest period. Brown rot is arguably the most important fungal disease on stone fruit; if not controlled, 100% of the crop can be lost in disease favorable seasons. So, it is critical that we preserve our best fungicides, namely the DMI, QoI, and SDHI chemistries (FRAC groups 3, 11, and 7, respectively) for control of brown rot. Table 6.4 on page 91 of the 2014 NJ Commercial Tree Fruit Production Guide lists the fungicide products that contain active ingredients with these chemistries; also, FRAC codes are provided on many product labels. The above approach to “fungicide preservation” is particularly important since the brown rot epidemic occurs throughout the peach harvest season from early July through mid-September. A grower harvesting from 10 peach maturity groups during this period could apply as many as 20 to 30 sprays for rot control. Integrating all three fungicide chemistries during this period is an important strategy for preventing resistance development. There is a group of fungicides that are only labeled for early season use on stone fruit. Fortunately, these materials have different chemistries than those listed above for brown rot control. So, from the resistance management standpoint, it makes sense to use these fungicides “up front” for blossom blight control. The first group of these fungicides, namely Rovral, Meteor, and Iprodione, each contain the active ingredient iprodione, which belongs to the dicarboximide chemistry class (FRAC group 2). These fungicides, which are locally systemic, are only labeled for use through petal fall; they have a medium to high risk of resistance development. In two field studies from the 2013 season, iprodione provided 100% blossom blight canker control under moderate disease pressure and 85% control under very heavy pressure. As a result, products with this active ingredient are rated as excellent for blossom blight management. Note most commercial orchards rarely have, if ever, the level of very high disease pressure encountered in one of the test blocks (59% shoots with cankers!). The second fungicide type available for blossom blight control is Vangard. This fungicide contains the active ingredient cyprodinil, which belongs to the anilinopyripmide or AP chemistry class (FRAC group 9). Fungicides in the AP class have a medium risk to resistance development. In the eastern U.S., Vangard is only labeled for two applications on stone fruit – at pink and full bloom. Like iprodione, cyprodinil also provides systemic activity. Vangard has been field tested for many years and generally provides 70-100% control of blossom blight canker formation; consequently, Vangard is rated as good to very good. In the 2013 studies, Vangard provided 90% control under moderate disease pressure and 68% control under very heavy disease pressure. The third fungicide limited to early season use is chlorothalonil, which is the active ingredient in various formulations of Bravo and Echo products. These fungicides are only labeled for use on stone fruit through shuck-split. Chlorothalonil, which belongs to the chloronitrile chemistry class (FRAC group M5), is a protectant fungicide with a low to practically non-existent risk of resistance development. Bravo has been rated as providing good control of blossom blight. However, under very heavy disease pressure last season, Bravo at a moderate rate provided only 51% control of blossom blight canker. Under less intense pressure typically observed in commercial orchards, chlorothalonil products probably provide acceptable control. Nevertheless, additional data are needed to further quantify the fungicide’s capabilities. In addition, chlorothalonil may potentially be toxic to bees visiting flowers; more concrete data is needed on this and other pesticides used during bloom. The final fungicide to consider for blossom blight control is Topsin-M, which also provides systemic activity. This fungicide contains the active ingredient thiophanate-methyl, which belongs to the methyl benzimidazole carbamate or MBC chemistry class (FRAC group 1). Although this product is labeled for full season use, the existence of resistant strains in orchards makes it difficult to employ Topsin-M for brown rot fruit rot control. However, application of one spray during the less risky bloom period is not entirely out of question. Under moderate disease pressure in 2013, Topsin-M provided 100% control of blossom blight canker. All of the above fungicides restricted to early season use, along with Topsin-M, have different chemistries than those “preserved” for fruit rot control. Since disease control ranged from good to excellent for these products, any combination could be considered. As an example of an integrated program, one could apply Vangard at pink, Rovral (or Meteor or Iprodione) at full bloom, followed by a mixture of Topsin-M + Bravo at petal fall. Using this schedule, all three timings have materials with systemic activity. In addition, Topsin-M at petal fall will provide some rusty spot activity and possibly anti-sporulant activity against peach scab lesions; data are needed to confirm this latter capability. As an alternative program, a pink spray of Vangard followed by bloom and petal fall sprays of Rovral would be acceptable for orchards with low scab pressure and cultivars not susceptible to rusty spot.